Bottom Line: A police procedural tailor-made for NFL fans. Eliot Parker’s Code for Murder manages to weave the Cleveland Browns into a story of murder, self-reliance, and family strife. As the book begins, Lieutenant Stacy Tavitt is back on the job after being left for dead in the Cuyahoga River. Her next case, the death of football player Devon Blake, takes her to the Cleveland Browns locker room, where Tavitt’s lack of football know-how proves to be a handicap. Toss in the addition of questionable performance enhancing drugs, and the good lieutenant is definitely in over her head, as is her partner, Austin Cerrera. As the story progresses and the body count rises, Lt. Tavitt gets more tangled in the investigation, but her health and familial conflicts get pulled into focus along with a somewhat unnecessary romantic tangent. Things get further muddied when Stacy’s personal issues start to create bumps in her professional aspirations. It’s a lot to take in, and it would help if Stacy was easier to root for. Parker hasn’t exactly created an anti-hero in Stacy Tavitt, but he has chosen to challenge readers with an extremely flawed heroine. The book picks up steam as clear and present danger appears in the third act. With that said, the eyebrow-raising climax may leave readers divided. 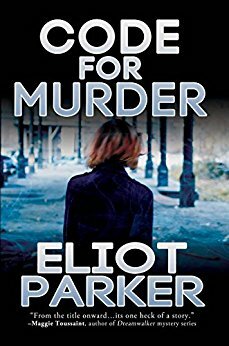 Many will want more from Parker’s murderous prose, while others may want to murder Lt. Travitt. Still, for NFL fans, this may be a game worth playing.